The feedback and response I’d had to this cycling venture, especially on Twitter, had been encouraging and much further reaching than I could have hoped for at such an early stage. With nearly 30 Twitter followers in a few short weeks, a steady stream of views on the blog and a ride planned, I had plenty to celebrate. However, would this initial mini buzz of interest actually translate into rides? This had been my main quandary in the week leading up to the inaugural Allez Prestwich ride. “Build it and they’ll come”. The hugely famous quote from Costner’s baseball-ghost-farm film, was a quote I’d been reminding myself of throughout the week, a little part of me getting carried away that I’d roll up on Saturday morning to scores of Prestwich cyclists, sardined into the little gateway that attempts to guard St Mary’s Flower Park from the madness of Bury New Road. Back in the real world I knew this was unlikely, but hoped if I could meet a couple of new people then it really would have been a successful couple of weeks. I’d already mentioned the ride to a few close friends that I ride with anyway, so hoped I would have some company but even that was not certain. The night before the ride I received some responses from a few of the aforementioned twitter followers. Unfortunately they’d not be able to make it but would be up for future rides. Rather than feel deflated, I actually felt buoyed. The blog site and the Twitter feed were working and, looking at the bios of the people who are following the club, it was the kind of crowd that I hoped existed and would benefit from the type of club I’ve setup. So, onto the day of the actual ride. I’d not heard anything from Gavin or Craig, the two mates I’d mentioned earlier, so as I scoffed my weetabix and guzzled my espresso, I was beginning to think I was going to be flying solo. Fear not, Gav had got slightly lost on the way and Craig got delayed by a broken elevator, having to cart his bike down from the eighth floor of his apartment building! 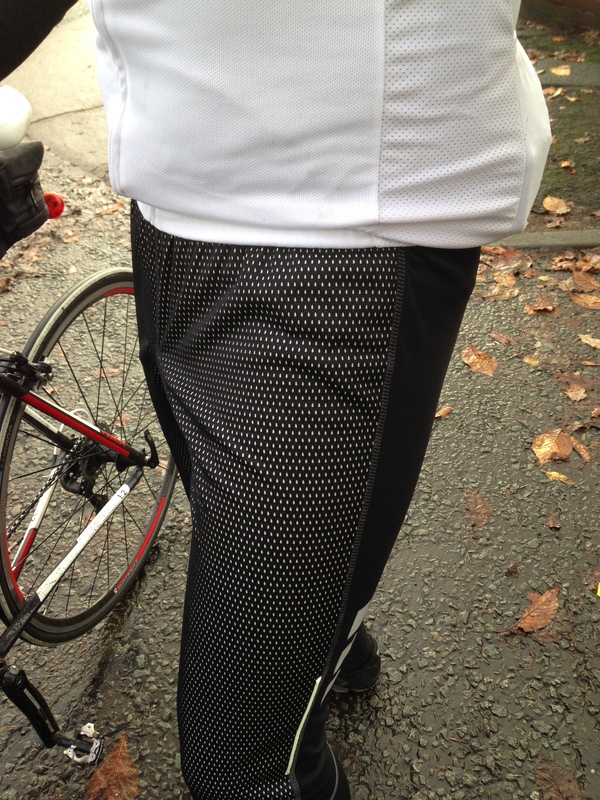 Craig’s snazzy new cycling jazz pants were a real show stopper early doors, so I must give him credit for the early pick me up. We set out from St Mary’s Flower Park and head out to Bury Old Road, ensuring we could cycle up the side of Heaton Park so it was a little more scenic before we hit Radcliffe. Up from Radcliffe, we head to Ainsworth and onto Bury. Nothing really to report at this stage, you’re just steadily climbing and descending, the way you do quite often around North Manchester/Lancashire way. Once we got to the big roundabout where the Bury B&Q is, we took a left as though we were going to Tottington, but then branched an immediate left in order to head up to Walshaw. We spotted a newsagents and took the opportunity to get a quick choccy bar in to get the blood sugar nice and high before we started the hillier parts of the route. 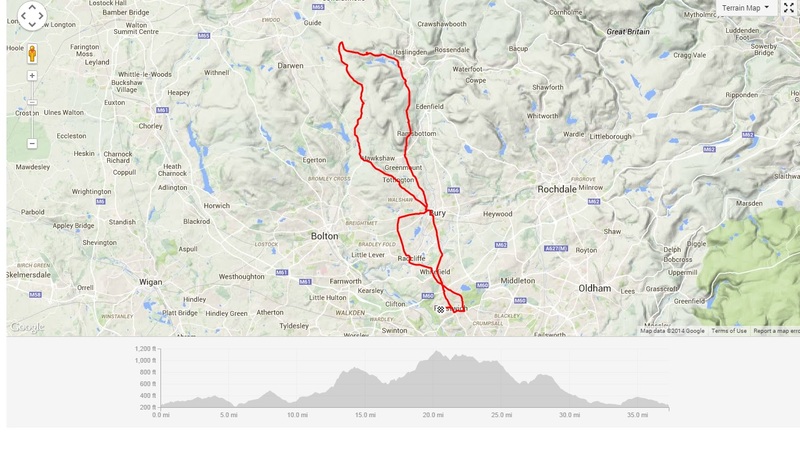 In hindsight it was a good job, as this section – shows as ‘Elton to Affetside via Walshaw’ on Strava – is a real grinder; almost constantly uphill, mixing shallower and steeper sections, it’s one you’ve just got to grind out and get your head down. Craig and I got to the summit of this 3 mile climb a little quicker than Gav, so we pulled over to the side of the road and noticed a little something on a car number plate that allowed us to pass a little time while we waited for Gav to catch up. Gav caught up and on we went. Things started to get quite foggy, and a little colder, as we were much higher up now. It lent a really eerie quality which was actually quite beautiful. We passed a village gridlock situation. A 4×4 and a bus had met in the narrow road and neither seemed to want to give way. A crazy tense situation. Sneaking round the potentially explosive gridlock situation on our bikes, we descended down towards Hawkshaw before taking a sharp right to head back up to Tottington. We had a decent descent around this point, which allowed a little bit of recovery in the legs before the final bit of climbing of the day. I’d purposefully left in the little teaser of Lumb Carr Road from my reccy ride (see previous blog post) to get a nice bit of elevation on the ride and to provide a nice little test for whoever joined the route. 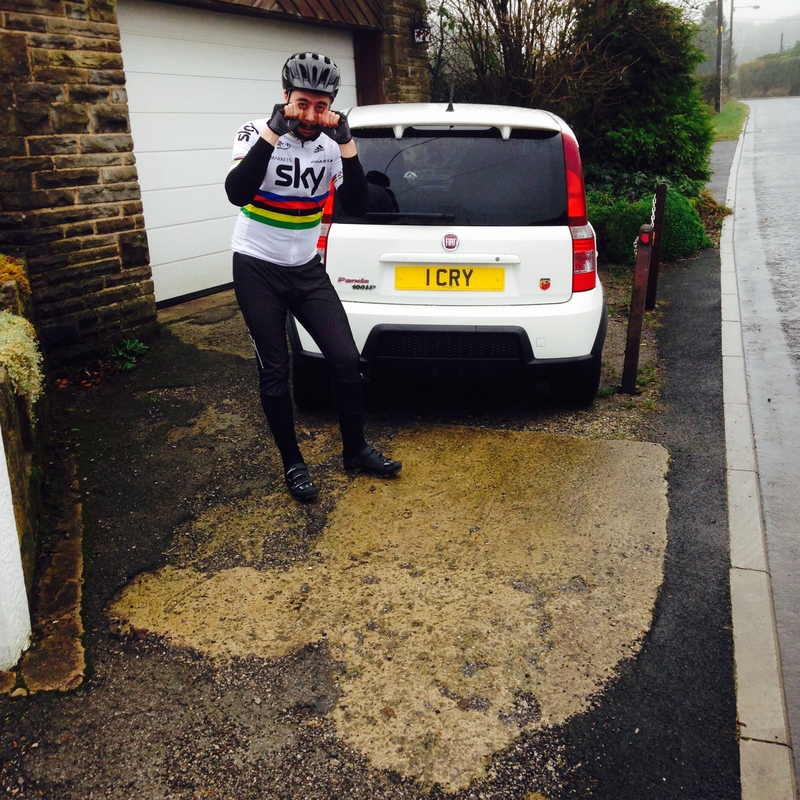 Gav’s back was playing up a little, so it was left for me and Craig to toil to the top of the Holcombe climb. We had a little breather, a chat about the climb and why we loved cycling so much and then cruised back down the hill to pick up Gav and head off home. Home was just a steady cruise back along the A56. All in all a great ride with good mates. Just like the Allez Prestwich tagline says “Good rides, better company”. I can’t wait for the next one, hopefully with a few new faces. Here’s the Strava link from the ride. Friday 24th October was a big ‘life moment’ for my wife and I. After 4 years of renting – in which time we’d had: three different homes, one engagement, a wedding, a honeymoon and a 1st year anniversary trip to Cambodia – we’d finally got the keys to our first home purchase together. Hoorah! All’s well in the world, the stresses of dealing with conveyancers, mortgage sales people and estate agents will soon be a distant memory and we can live happily ever after. “Laura, the handle has came off the bedroom window”. “Laura, barely any of the handles work”. “Laura there is a massive hole in the spare bedroom and the plaster is coming away in my hands”. “There’s no hot water pressure at all upstairs”. You get the idea. After a stressful day and a half of hard work (and 2 months of handling the purchase), coupled with making some pretty expensive decisions, my wife kindly sent me out on a ride to clear my head. I thought it was a great opportunity to do my first reconnaissance mission for my newly formed cycling club in my new habitat. With all the intentions in the world of “just popping out for a quick 20 miles”, various decisions meant that I wound up doing 40. Not good on my recovering (read: never recovering) knee but a bloody good time anyway. Off I went, skirting round the side of Heaton Park, heading North towards Whitefield before cutting off down towards Radcliffe. Having left my bottle on the side at home (doh! ), I had a quick stop off at a newsagent for a bottle of water and an energy drink. Onwards, towards Ainsworth/Tottington and things start getting a little hillier. Which, in my eyes, is a a good thing. I’d being around this general vicinity once before with friends, and was familiar with Ramsbottom/Helmshore area and the wonders of the Grane Road. I decided to use that as a loose target, as I kind of had an idea of where it went and how I’d get back. Things started to get pretty ‘real’ at Lumb Carr Road up towards Holcombe. There’s a real nice, challenging little climb here and it really got the heart pumping and legs aching, especially as I’ve had little climbing recently. I made a mental note of this climb and thought it would be a nice one to get into some of the monthly rides. After this, stood outside the ‘The Shoulder of Mutton’ pub at Holcombe, I’d kind of thought, should I do a u-ey and just head home or soldier on and complete Grane Road so I could explore more of the area. On it was. Good decision? I wasn’t sure. The weather changed a little (grey, wind picked up) and my energy really started to go and nature started to call as I passed through more hills, eventually toiling my way up Grane Road into the wind. There, like a beautiful Lancashire oasis, I saw signs for a cafe. 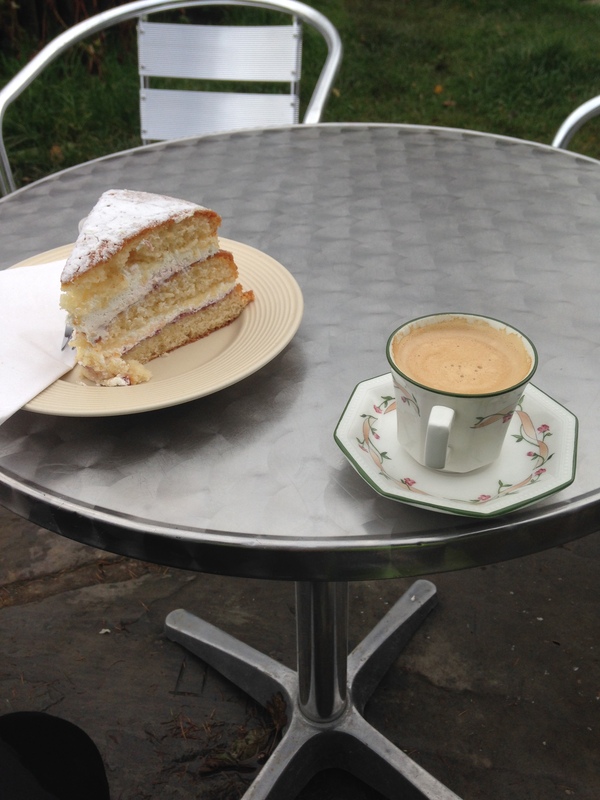 So I stopped, answered nature’s call (I know, too much info but if you gotta go…), got a nice espresso and slice of Victoria sponge. Thoroughly glad I’d remembered to pick that fiver up before I left, as I think this saved my bacon. 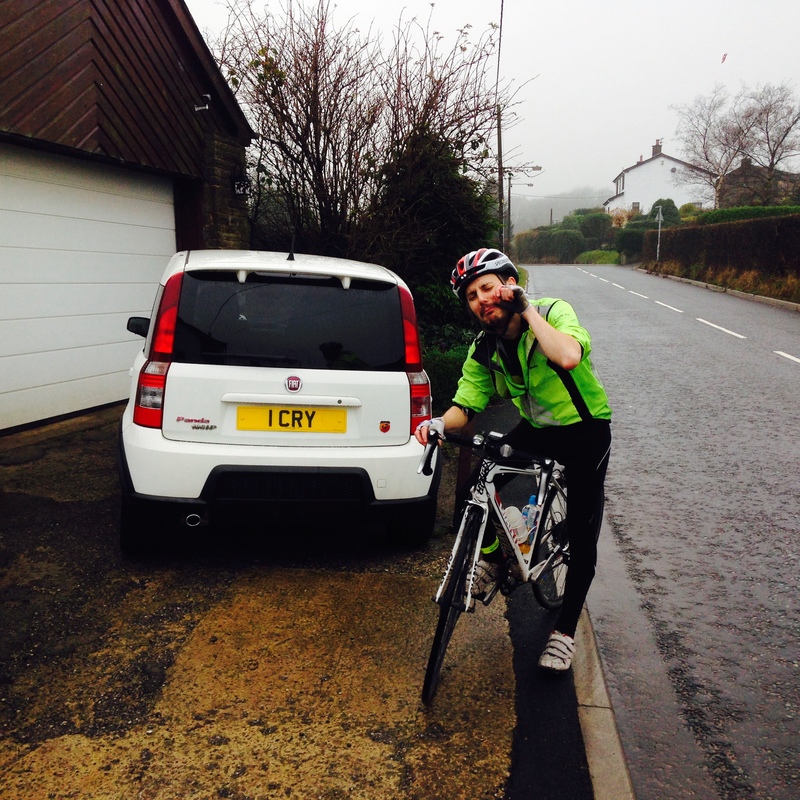 Feeling refreshed, I set back out and climbed the remainder of Grane Road until my next turn which, I believed, was going to be a nice downhill meander back down to somewhere around the Tottington area. Wrong. This was pretty undulating and there was a testing little hill pretty early on once I’d turned down Jackson Heights Road. A stream of 20+ kitted club members were coming the other way down the hill, so must have been a nice pick-me-up for them to see me, mouth gaping, slogging up the hill on my tod while nodding and mumbling “hi” at each and every one of them. My knee started to get quite uncomfortable around this point, but I could see the silver lining in the fact that this whole section was the most beautiful part of the ride in terms of scenery. From wild Lancs moors, to little interspersed coppices, it really was quite lovely. A short canter down through Tottington and back to the ‘comforting’ bosom of the bustling A56 that slices through my lovely new town. Left with my head a little clearer and my knee a little sorer, I’d enjoyed my first ride from my new base and had at least a few ideas for my first Allez Prestwich ride. Here’s a link to the strava route and a zoomed out image of the map/terrain.